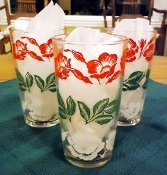 We are delighted to offer these Swanky Swigs Red, Green, White Flower Jar Glass Tumbler Set. The set includes three (3) identical pristine condition tumblers. The tumblers have a clear glass body decorated with white flowers at the base, green leaves in the center and red flowers at the top. The Swanky Swigs Red, Green, White Flower Jar Glass Tumblershave a weighted, heavy clear base. Each of the available Swanky Swigs Red, Green, White Flower Jar Glass Tumbler Set is in Mint condition with no chips, cracks or wear to the gold. the colors are vibrant, the colors crisp. The Swanky Swigs Red, Green, White Flower Jar Glass Tumbler Set stand 5-3/4 inches in height and measure 3-1/8 inches in diameter at the top, 2-1/8 inches in diameter at the base.